Let’s check in with the Oregon family who won the home improvement sweepstakes of a lifetime. 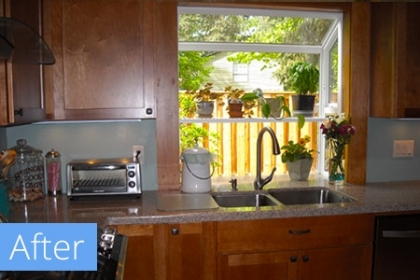 She was standing in her kitchen in Oregon at the time, and thought about just how long she and her husband had been putting off their kitchen remodel. “So I read the rules and I entered every day online,” Bernadette says. 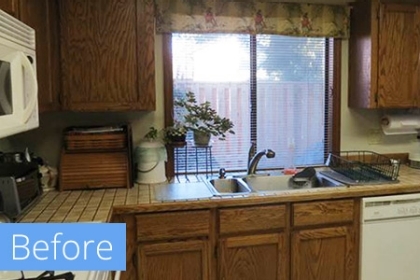 Just a few weeks later — on her birthday, in fact — she found out that she had won a dream kitchen makeover. “I thought it was a scam!” Bernadette says. She was happy to learn it wasn’t. As the grand prize winner, she received a voucher worth up to $25,000 towards a complete Sears kitchen remodel. The project could include cabinets, countertops, flooring, lighting, hardware, installation and a dedicated project coordinator. Bernadette quickly realized that her dream had become a reality. Early this year, Sears reps came out to discuss the kitchen remodeling project — a meeting that really helped narrow down the couple’s wish list. “We had been thinking about remodeling anyway and had a lot of ideas,” Bernadette says. She and her husband had considered making an upgrade for the last several years. 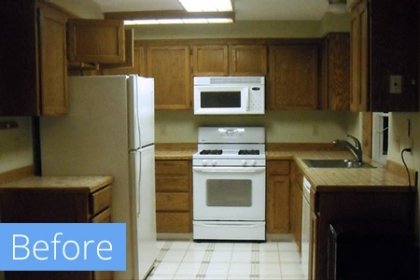 They wanted to increase the efficiency of their cabinets and create more countertop space. So, within a few weeks, the project was underway, and they said goodbye to their old kitchen. All of the old cabinets and appliances were torn out. “They gutted it, so there were just walls. Everything is being replaced!” Bernadette exclaims. Through the help of Sears Home Services, Bernadette and her husband were able to increase their countertop space, maximize the efficiency of their storage space by eliminating unusable areas, install custom maple cabinets with a hickory finish, and add brand-new quartz countertops. The project, which wrapped up in mid-April, took just three weeks. The end result? A brand-new dream kitchen for the lucky winner. You, too, can have the kitchen of your dreams. 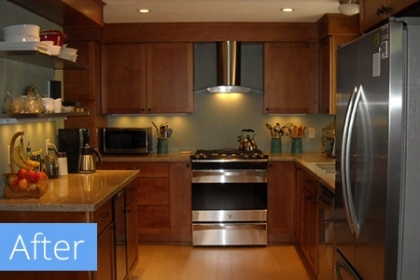 Explore all your different options in our Kitchen Remodel store.